So Ignite is over and back to work we all go. If you are like me you may still be recovering from the miles and miles of walking, the overwhelming Expo, and cramming all the knowledge in my head from all the sessions I was able to attend. There are so many more sessions I would love to have attended. There are also sessions I would love to watch again. The good news is I can re-visit the sessions I attended and watch the sessions I didn’t make it to. You can download the sessions and the associated media. It is pretty simple to use and has a number of parameters with retrieving specifics sessions by title, speakers, product, etc. Event specifies what event to download sessions for. Valid values are Ignite (Default) or Inspire. InfoOnly Tells the script to return session information only. By default, only the properties session code and title will be displayed. DownloadFolder Specifies server to configure. When omitted, will configure local server. Format Specify mp4 video format to download using youtube-dl.exe. Direct downloads are in the format provided. For Azure media, you can specify quality as worstvideo+bestaudio/best; for YouTube videos you can specify the format number, e.g. 22. Keyword Only retrieve sessions with this keyword in their session description. Title Only retrieve sessions with this keyword in their session title. Speaker Only retrieve sessions from this speaker. Product Only retrieve sessions for this product. NoVideos Switch to indicate you don’t want to download videos. NoSlidedecks Switch to indicate you don’t want to download slide decks. ScheduleCode Only retrieve sessions with this session code. You can use one or more codes. MaxDownloads Specifies maximum number of simultaneous video downloads (default 10). 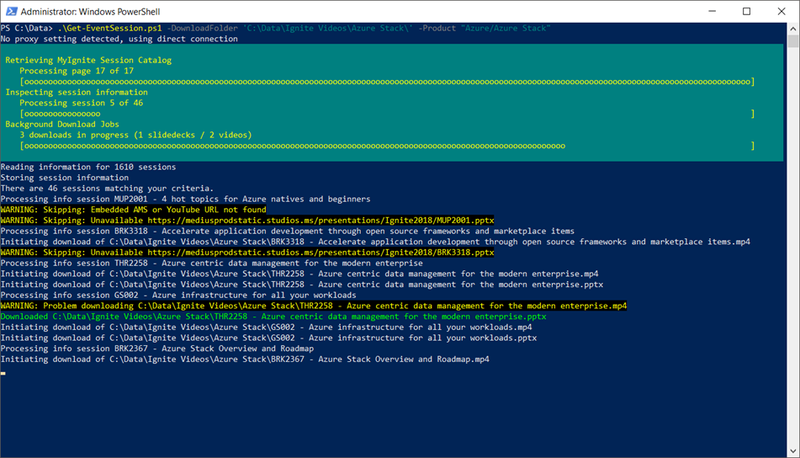 For my example, I will use the following parameters to download all Azure Stack related sessions by Product.